True. But what exactly are you referring to? Noah and the flood? Moses and the flaming bush? Sodom and Gomorrah? The problem is assuming the Biblical stories are correct. That's a strong statement, I await examples for discussion. Btw: welcome to the forums alphamale06! I also am a Christian, and I can see many, many Scriptures where the possibilities of Extraterrestrials fit in perfectly to support what you propose. In fact, at present I hold the view that *possibly* there were ET sentient beings who have participated in events on Earth in the past, and *possibly* are doing so right now in ways that will affect Man's future. ... Sheer speculation of course. However, I have reconciled (in my mind, to my satisfaction) all those aspects with the existence of the Biblical Creator God, and Jesus as our Saviour, as described in the Bible. So I am a Christian who believes in the possibility of ETs. probably the "fallen angel" story.... fallen angel translates as REPTILIAN if you will.... or rather the fallen angels' kids *the giants* are the reptilians, the offspring of humans and fallen angels, the nephilim. Basically, apart from the general vagueness of the stories in the Bible (which of course is in large part due to the fact that they were written by superstitious wandering desert herdsmen...), the fact that very little cannot be explained mundanely (apart of course from the physics-defying things like the global flood, the sun staying in the sky for 48 hours, etc...) just isn't terribly conducive to the need to grasp for speculative solutions like extraterrestrials. I admit, the speculation is intriguing, and could be what happened (how the hell should I know what they saw? ), but the fact of the rather poor descriptions given, the myriad possible explanations, and, quite frankly, the aspects of the stories which just plain would make such an explanation unlikely (not even considering the fact that extraterrestrial intervention is a rather improbable occurrence to begin with), just makes me think that aliens in the Bible just don't sound very plausible. That's not to say of course that the stories which preceded the Bible (the Sumero-Babylonian stories, the Hindu Vedas, the Egyptian writings, etc.) do not have tales to tell and descriptions to give which are a bit more conducive to such a possibility (I myself have spent years studying the possibility of extraterrestrials, high technology, advanced science, etc., in the texts of ancient India, for example; though it is, in part speculative, the speculations are fascinating, and, I think, a bit more sound than similar speculations which are applied to the biblical texts). As I say: it is not entirely impossible, or even entirely unfounded, to think that perhaps there are accounts of extraterrestrial contact preserved in the Bible; but again, it is rather improbable (in no small part due to the fact that the truth of the claims made in the Bible is highly debatable in the first place). Shoehorning ET into the mix to try and explain angels and Gods from the bible, is like trying to explain Bigfoot using Mothman. Of course, it is possible that visitors from outer space did land on earth a few thousand years ago and communicate with our ancestors. But it seems more likely that prehistoric peoples themselves were responsible for their own art, technology and culture. The ancient astronaut hypothesis is unnecessary. Occams razor should be applied and the hypothesis rejected. To me, I think were this ancient alien theory falls on it's face is the nature of such interventions. For example, why would they, by levitation presumably, help built pyramids, Stonehenge etc, and not give more important help like medical knowledge, or knowledge to better grow crops a long time before we worked out efficient crop rotation and irrigation. In these matters there is not a sudden advance, but a very long evolutionary process. If ancient aliens wanted to help us, then why not with matters that really help, and not just religious or even vanity projects. I didn't start this thread but it's interesting. The flood in the story of Noah's Ark and the flood in the Sumerian story of Gilgamesh are very similar. alphamale, do you need some help to learn how to quote and post? Just because a hypothesis can 'work' doesn't mean it's well supported...one still needs evidence to support it. There are far too many assumptions with and far too little evidence for the ancient alien hypothesis. Now, if someone were to dig up a piece of alien technology/hardware that would certainly change things. Until there's some strong evidence all the AA hypothesis has is speculation. It takes a certain type of understanding to really embrace the ancient alien theory, as most skeptics do not, cannot, and will not be able to process this information. Yes, there is a God and Jesus Christ did walk this Earth, however , I am of the opinion that there roles and purpose was misunderstood .... I am also a Christian that also believed extraterrestrials played a huge part in developing mankind..... There is NO debunking the building and creAting of these enormous ancient structures..,,anyone who thinks that regular human beings built these structures are not capable of processing the truth ... It is not there fault ..... Some people are not meant to understand.. But in due time all will know. It seems you use "truth" when you really mean unsubstantiated claim. Back in the 80's, I was sort of in the same boat. Are you familiar with Petra? Their song: "Not Of This World" quotes verses that could be argued to support your pov. "We are strangers, we are aliens We are not of this world." Surely this was a reference to the nomadic history of the people. That's the thing about the living word though, it can be used to support many, even conflicting, viewpoints. Try that one for a start. 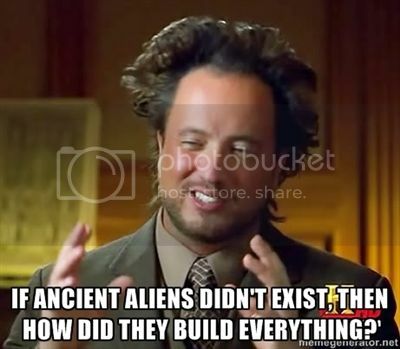 Ancient Aliens seems to make a lot of sense if you have very little actual understanding and knowledge of history. The more you learn, the more you come to realize that the idea just isn't supported. Here's a good place to start. Good one, boon,... thanks for posting that. Just because we dont know every and all details of how our ancestors built this or that do NOT leave the door open for ET. To claim that extraterrestrials visited Earth back in the days (based on the evidence I have seen to date) takes a gigantic leap of faith. Thanks Hazzard, it is probably one of the best condensed videos on the subject that I've seen. It packs a lot of information into very small chunks that are fairly easy to digest, and any who are interested in further pursuing information like this can find even more throughout the forums, mostly in the Ancient Mysteries & Alternative History section. This is the first thread that I read when I came here: Ancient Astronaut Theory, and even though it wasn't easy to get through at times, I found the information provided invaluable. Prior to reading that thread I was pretty well convinced that the History Channel's Ancient Aliens series, and a few other things that I had read and watched had done a very good job of supporting the idea. This isn't to say that any of this information proves aliens have never been here, but it does disprove and more fully explain the evidence that is commonly used (or rather misused) in an effort to support the idea.